Trending news reports are suggesting that you should skip the gym and hit the bar instead. 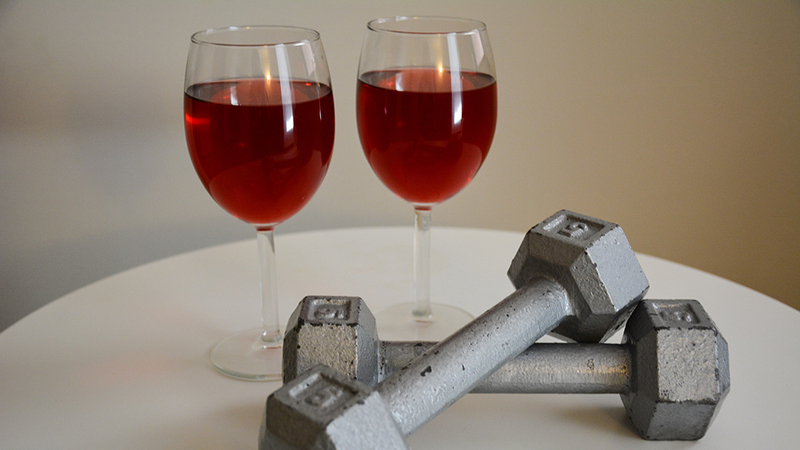 But contrary to those recent viral reports, drinking one glass of wine is not equivalent to an hour of exercise at the gym, University of Alberta researchers say. In 2012, Professor of Pediatrics and Director of Cardiovascular Research Centre Jason Dyck and his team discovered in 2012 that the polyphenol compound resveratrol might be a natural exercise performance enhancer. Their findings were published in the Journal of Physiology in May that year. It just so happened that resveratrol can also be found naturally in various foods such as nuts, fruits and red wine. “We didn’t study red wine, and we didn’t study human patients, and we didn’t look at the equivalent to one hour in the gym, or even made suggestions that that was the case,” Dyck said. What Dyck and his team did in the 2012 study was find a supplement that may make exercise more accessible to patients experiencing heart failure. In a 12-week period, the team tested concentrated amounts of resveratrol on lab mice showing symptoms of heart failure, such as fatigue and lethargy, and then trained them to run a treadmill. The treated mice later showed significantly less signs of heart failure than the untreated mice. Now, the Alberta Diabetes Institute is funding Dyck’s team to test the compound on patients with Type 2 diabetes, who are at a high risk of heart failure. The team is currently filling in their Health Canada applications and ethics applications before beginning the trials. If they succeed, diabetics prescribed with resveratrol may be able to exercise more easily without being limited by the symptoms of heart failure. To do this, patients may be prescribed as much as 200-mg of resveratrol each day. While drinking one glass of red wine every day may eventually provide some health benefits, the resveratrol doses that Dyck has planned for these trials far surpasses the amount in an entire bottle of wine. This is not to say that red wine is not beneficial. Neglecting to maintain a nutritiously balanced diet can be just as harmful as relying on foods to replace other important things, such as supplements and physical activity, Dyck said. As long as it is taken in moderation, it is possible for wine to be part of a healthy diet.